Convenience stores and mini marts have traditionally installed surveillance cameras to deter crime and encourage safety. Too often, however, these have provided images that lacked detail, particularly in low-light conditions. Retrieving video has usually been tedious, requiring endless searching and scanning to find the desired footage. Sharing and archiving of the video has also been cumbersome, wasting precious technical and management resources. Now, advanced digital IP video cameras and recorders are capturing clearer images inside and outside the store in various lighting conditions to deter theft, fraud, and unjustified claims such as slip and fall incidents. By providing easily retrievable and emailable surveillance video evidence, this approach is even enabling the swift collection of full compensation when store property is damaged. The surprisingly economical IP network surveillance systems also enable executives to efficiently monitor store conditions from home, headquarters, or anywhere with an Internet connection. 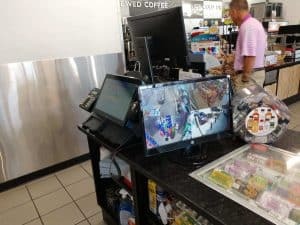 “With an advanced surveillance camera system, a convenience store chain could achieve ROI within a year through better prevention of theft, fraud, and unjustified claims as well as improved operational oversight,” said Todd Harrison, the IT director who oversees loss prevention camera surveillance for Sprint Food Stores, which operates 20 convenience stores in Georgia and South Carolina. Previously, Sprint Food Stores used lower-resolution cameras that required onsite DVD burning as a means of storage. According to Harrison, limitations in surveillance video quality and connectivity were the main reasons that the convenience store chain sought an alternative. The surveillance system can also help to identify and deter potential cash register transaction theft, which can occur, for instance, through unscrupulous voids or no-sale register transactions. The surveillance system integrates with the store POS system and provides Smart ER exception reports, a type of advanced filtering software included with the surveillance system. Using the software, a quick analysis of thousands of register transactions can be done to identify suspicious activity and pull up the associated video for review. “The district manager may get alerts from the exception system if there are an extreme number of voids or no sales, so it may bring up ten seconds of video after each to review,” said Harrison. Deterring and disproving fraudulent claims is another benefit of implementing easily accessible, high-quality surveillance video. The information can be used to deter unwarranted claims for slip and fall or workers compensation, for example. Harrison relates how, at one location, a truck driver ran into a 3-foot high, LED diesel fuel sign, destroying it, before driving off. “When we emailed the trucking company the high-quality surveillance video of the incident with their truck/trailer number and company name clearly readable, we were promptly compensated,” says Harrison. “Video can be reviewed and archived remotely as needed, which eliminates the need to spend hours every week traveling to burn DVDs for video storage,” said Harrison. He noted that the remote viewing of store video also gives the chain’s operations manager a window into how each store is doing without having to travel to each on a daily basis. A quick glance, for instance, can help to verify that employees are in uniform, at their work stations, and serving customers without long lines, etc. The surveillance system also has an optional video analytics software module that could help Sprint Food Stores more effectively merchandise retail items, according to Harrison, who noted that the chain is not currently using this option, but may do so in the future.